PRINCE NIKOLAUS WILHELM OF NASSAU Autograph Letter Signed. German Prince of the House of Nassau-Weilburg, son of William Duke of Nassau and Princess Pauline of Wurttemberg. ALS. 2pp plus integral blank leaf. Together with original envelope. Monrepos. 30th December 1864. To Miss Eliza Tolmé. "Dear Miss Eliza! Please to accept my best thanks for your and your sister's kind help in the making of the plum-pudding which your mother was kind enough to send me for Christmas! I shall of course now enjoy it the more knowing that such fair hands did their best to sweeten it and I hope that all the good wishes you put into it shall profit me in the coming year. I shall most readily comply in your request to procure autographs, though I am afraid it will be pretty difficult to get interesting ones. I have written immediately though to get an autograph of the late Ch[ancellor] Bunsen which shall soon been [sic] forwarded to you. Wishing you a very happy new year, please believe me always yours most truly" [etc]. 16mo. Approx 5.25 x 3.5 inches. The envelope is affixed to the integral blank leaf. Mounting remains to the verso of integral blank leaf. Some old vertical creasing to first leaf. All else fine. 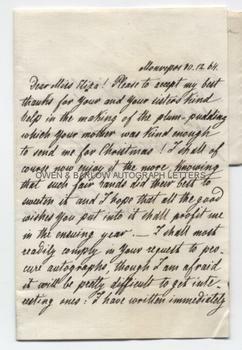 A charming letter from the still young Prince Nikolaus Wilhelm, who appears to be quite smitten with the Miss Eliza. At the date of the letter Prince Nikolaus Wilhelm was unmarried and it was not until 1868 that he was married morganatically in London to Natalya Alexandrovna Pushkina, daughter of the Russian author and poet, Alexander Pushkin, talked of as 'one of the most charming women of her day' and thought by some to be a possible prototype for Tolstoy's Anna Karenina. Provenance: From a 19th century album compiled by the Blyth family. Edmund Kell Blyth was a London solicitor and author of a biography of Dr. William Ellis. The Blyth family was related to the Tolmé family by marriage and we believe Eliza Tolmé was a first cousin to Edmund Blyth.